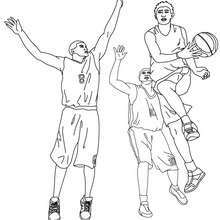 This beautiful Basketball players in action coloring page from BASKETBALL coloring pages is perfect for kids, who will appreciate it. You can print out for free this Basketball players in action coloring page. Enjoy coloring on Hellokids.com!